Maps showing noise levels from roads and railways have been published as part of a scheme to show how noise pollution might affect families. Covering some of Wales' major cities such as Swansea and Cardiff, it also covers urban areas like Port Talbot. It follows European union measures to highlight the problem and combat noise nuisance. Environment minister Jane Davidson said it was a first step towards bringing down noise levels. 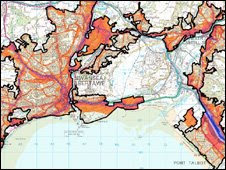 The mapping was carried out during 2006 and 2007 and the results have been made available online to download from the assembly website. The zoomable maps include a breakdown of noise from roads, rail and industry after what the assembly government calls one of the biggest IT projects in Wales..
"The publication of the noise maps is the first step towards highlighting the importance of tackling excessive noise and making Wales a quieter place," said Ms Davidson. "Excessive noise can be deeply annoying for all concerned and can have serious side-effects not least sleep deprivation." It is expected the maps will be used to draw up plans to tackle noise problems from roads, and railways and in urban areas.